Described as an enthusiastic collector, Asa was one of the moving forces behind the creation of ALPCA in 1954. An article about his plate collecting was published in the Boston Post in 1954 and it was this story that caught the eye of Dr. Cecil George. The two began corresponding shortly after and the die had been cast for the creation of a formal organization devoted to the collection of license plates. Naming this new club took a little longer. Early suggestions were the National Association of Collectors and Roaming Numerals. The first organizational meeting in December 1954 established the club and assigned Asa membership # 2. He was the club's first "temporary" secretary and continued in that role through the formative years. He served as newsletter editor from 1954 to 1961. He preferred swapping plates rather than buying and selling. Asa was a warm and friendly person who delighted in greeting plate collectors at his home and at club events. He was also a typical frugal New England Yankee who served as the postmaster of Rumney Depot, New Hampshire where the club was incorporated. 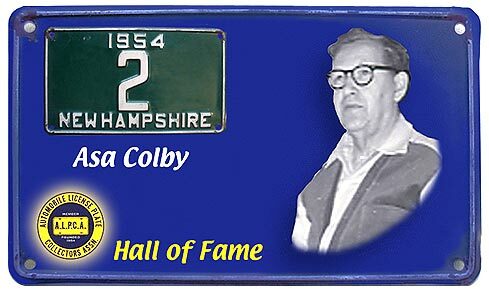 Additionally, he ran the general store in Rumney Depot (which was part of the post office), sold insurance, owned and operated the Colby Press, volunteered on the local fire department and served as Secretary of the New Hampshire branch of National League of District Postmasters. He began serious collecting in 1949. His print shop and the general store were covered on all walls and the ceiling with plates but his collection was "down cellar" in boxes, with a box for each jurisdiction well marked. He was nuts about foreign plates and wrote to postmasters around the world suggesting that they trade license plates. One of his prized plates was Vermont Auto Register #700, which he didn't acquire until the mid 1960's. His wife, Velma, did not share in his enthusiasm for collecting and would frequently berate him when he allowed his supper to get cold because a plate swap was in progress. Asa had his priorities straight, food could wait! As has been said the hobby is about fellowship and the challenge. Asa passed away in January of 1973 at the age of seventy-eight. We honor him as the second inductee into the ALPCA Hall of Fame.